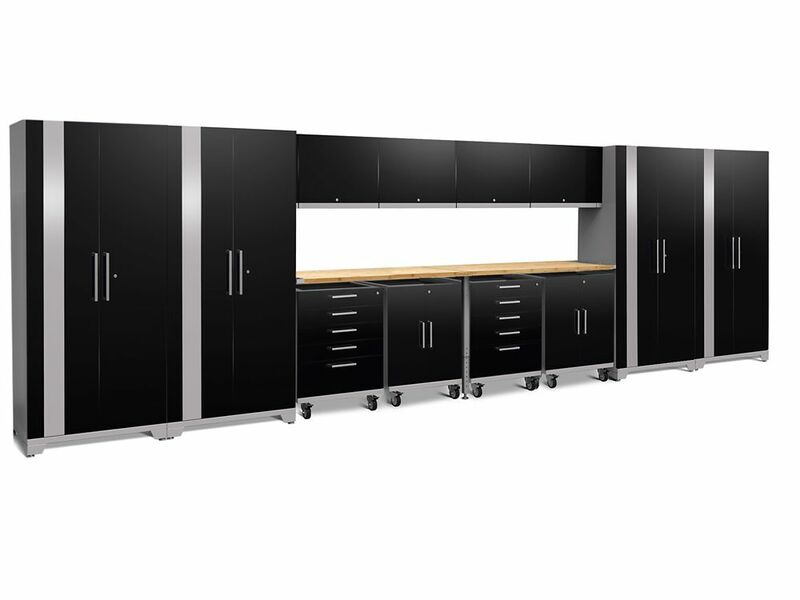 Performance Plus 2.0 Series 14-Piece Mobile Set in Black Bring your garage into the 21st century with our newly redesigned, Performance Plus 2.0 Series; our first fully mobile, modular garage cabinet series yet! Each cabinet features fully welded, 18 gauge steel frames with fully lockable double-walled doors; that's 100% stronger than our Performance Series! Weve included soft-close door hinges, adjustable steel shelving, full extension drawers, integrated top tool trays on your base and tool cabinets and many more premium features. Our newly designed Mobile Spacer Kit allows you to change your once static garage set into a fully functional mobile set; with included casters, your base and tool cabinets can now slide in and out of your set with ease, leaving your worktop stationed. Performance Plus 2.0 Series 14-Piece Mobile Set in Black is rated 4.8 out of 5 by 4. Rated 5 out of 5 by Mike from Outstanding quality Everything I’d hoped for and more. Well packaged and quick delivery. Competition can’t hold a candle to quality and value. Rated 5 out of 5 by Wowser from Great value for money Shipping was faster than expected with no damage. Boxes were dinged on outside but excellent packaging saved the product inside. Better quality than I was expecting. Not Snapon sturdy but didn’t pay stupid prices either. Great for my shop! Rated 5 out of 5 by Cabinet review from Very sturdy cabinets I bought the tall cabinets with a workbench and rollaway cabinets in March of 2018. The entire shipment came on 2 pallets. The construction is very robust. What I found out during installation was how not straight and perpinduclar my garage walls were. The cabinets bolted together easily. The workbench is solid and the bamboo is very hard. I had some cosmetic damage to a couple of the cabinets but was able to work with NewAge to come to a fair compensation. The one thing I would warn others about is that the height of the cabinets on a double pallet would not fit through a standard garage door height. We did have to take apart the packaging in order to move everything into the garage. Luckily I had a sunny day for my delivery so it wasn’t really an issue.